Is it ever acceptable to lie? This question plays a surprisingly important role in the story of Europe’s transition from medieval to modern society. According to many historians, Europe became modern when Europeans began to lie—that is, when they began to argue that it is sometimes acceptable to lie. This popular account offers a clear trajectory of historical progression from a medieval world of faith, in which every lie is sinful, to a more worldly early modern society in which lying becomes a permissible strategy for self-defense and self-advancement. Unfortunately, this story is wrong. For medieval and early modern Christians, the problem of the lie was the problem of human existence itself. To ask “Is it ever acceptable to lie?” was to ask how we, as sinners, should live in a fallen world. As it turns out, the answer to that question depended on who did the asking. 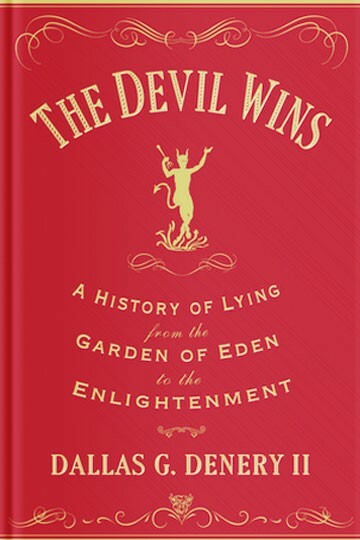 The Devil Wins uncovers the complicated history of lying from the early days of the Catholic Church to the Enlightenment, revealing the diversity of attitudes about lying by considering the question from the perspectives of five representative voices—the Devil, God, theologians, courtiers, and women. Examining works by Augustine, Bonaventure, Martin Luther, Madeleine de Scudéry, Jean-Jacques Rousseau, and a host of others, Dallas G. Denery II shows how the lie, long thought to be the source of worldly corruption, eventually became the very basis of social cohesion and peace. Dallas G. Denery II is associate professor of history at Bowdoin College. He is the author of Seeing and Being Seen in the Later Medieval World: Optics, Theology, and Religious Life and the coeditor of Uncertain Knowledge: Scepticism, Relativism, and Doubt in the Middle Ages.